This post is in celebration of the launch of the new Palomino Blackwing 602 we release for sale at midnight tonight and as a fun way to share my own poetic creativity this month given our contest themes. Thus I’ve written my own “Ode to Blackwing” shared here below. Not a great literary effort, but I had fun writing it anyway. A more detailed account of this pencil’s history can be found here or here. 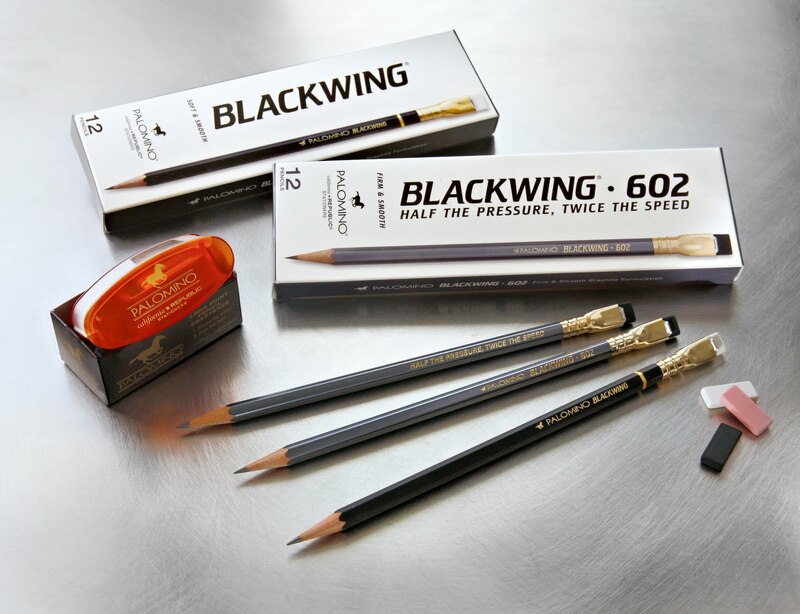 Anyway I hope it will inspire you to check out and participate in our Drawing and Writing Contests this month to win free Palomino Blackwing and Palomino Blackwing 602 pencils. There once was a pencil, it was really the thing. No pencil could rival it’s metallic lacquer sheen. had an extendable flat eraser, though that tended to age. Some really thought this pencil fit their special need. Was favored by writers, musicians, artists and more. Their creative energies were really unleashed. To them other pencils were just second fiddle. with flowing lines that went down smooth as silk. Selling Blackwings by the pencil for 20, 30, 40 bucks a pop! So Woodchuck toiled and tinkered, thinking how can it be done? There’s just not enough volume, it’ll cost a ton. So sought feedback from bloggers, and all hell broke loose. Where’s that gray, metallic finish? What about my pink eraser? No 602? And why did you drop that slogan, Half the Pressure? But boy we sharpen so often, it really takes some labor. To refine this pencil for those he wished still to woo. I’ve got the Blackwing Blues. Sick of paying 30 bucks for my 602’s. Cause the Palomino’s comin’ out tonight!